"Thank you to everyone that has supported me at the concepts at Jax Beach. Me and my team will still take great care of you @gilberts_social and @gilberts_uk..."
Chef Kenny Gilbert, recently voted Jacksonville's Best Chef in Folio's Best of Jax 2018 readers’ poll, has decided to cut ties with four Jacksonville Beach restaurant concepts. 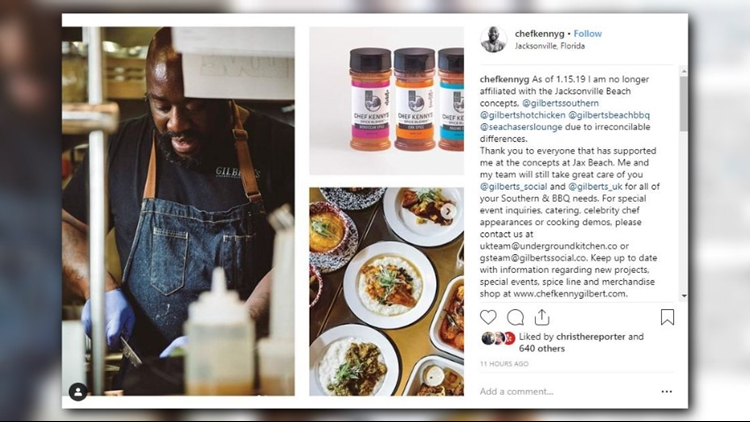 He posted on Instagram that as of Tuesday he would no longer be affiliated with Gilbert's Southern, Gilbert's Hot Chicken, Gilbert's Beach BBQ and Seachasers Lounge but didn't go into specifics. "As of 1.15.19 I am no longer affiliated with the Jacksonville Beach concepts, @gilbertssouthern@gilbertshotchicken @gilbertsbeachbbq@seachaserslounge due to irreconcilable differences. Thank you to everyone that has supported me at the concepts at Jax Beach. Me and my team will still take great care of you @gilberts_social and @gilberts_uk for all of your Southern & BBQ needs...."
According to Instagram, Gilbert's Beach BBQ is expected to open in April and specialize in bbq, tacos, pulled pork, brisket and ribs. We have reached out to Chef Kenny Gilbert for additional details about his announcement. There is no word at this time on how this move will impact the restaurants or whether or not the existing ones will consider a name change.